Swing and a miss for Eddie Alvarez (Pictured). The lightweight superstar was denied injunctive relief from his contractual obligations with Bellator Fighting Championships in U.S. District Court in New Jersey on Friday. Alvarez was hoping Judge Jose L. Linares would rule his prior employer did not match the offer sheet he received from Zuffa, LCC, the parent company of the UFC, and that he was free and clear to sign with the planet’s premier mixed martial arts promotion. The free agent would compete at UFC 159 on April 27th, ironically just a few miles away from the courthouse, had things gone his way today. As we broke down earlier this month, the two key factors Alvarez believes Bellator’s contract offer differs from the UFC’s proposal is television exposure and pay-per-view bonuses. Alvarez claims the exposure he would receive though the UFC’s partnership with FOX (free national broadcast) is far greater than what he would get from Bellator’s arrangement with Spike TV (basic cable network). Furthermore, the UFC agreed to give him percentages of PPV buys on cards in which he challenged for and defended the title. Bellator has never offered a PPV broadcast in their four-year existence, but claimed to have plans on arranging one in the near future showcasing a rematch between Alvarez and lightweight champ Michael Chandler. While Judge Linares admitted Alvarez might prevail in court when arguing the key differences between FOX and Spike, Linares revealed he couldn’t make that decision based off the evidence presented today. Furthermore, Linares said he wasn’t in a position to determine whether Bellator would breach their contract by failing to promote Alvarez in a future PPV. Because the 29-year-old didn’t demonstrate his suit would succeed, the injunction was denied. It seems the legal battle is only just beginning between Alvarez and Bellator. The two parties can still come to a peaceful resolution outside of the courtroom. 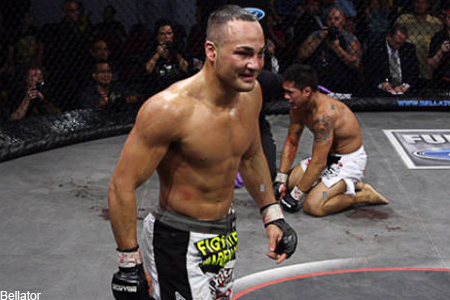 However, that would likely have Alvarez headed back to Bellator, the place he’s called home since April 2009.